Our garden at home was experiencing some odd activity. The predlets had planted some spinach and some corn and carrots. One morning the spinach was looking a little flattened. The predlets then started an investigation. It was a bit like CSI Basingstoke. They found (and photographed) what they thought was evidence of an animal. So the hunt is now on. This LtL-6210M has all sorts of interesting features. It has a zero visible light LED flash to enable the night camera to work, it has side sensors to get the camera ready and waking up before something moved in front of the lens. It can take stills up to 12Mp! and HD video too. It has lots of timer settings and also is able to just do time lapse shots. Apparently it can last 12 weeks on its 8 AA batteries which is pretty amazing too. In the base is a small screen and control set so it can be operated and used without needing to take the SD card out of the machine. So we set it up overlooking the veg patch last night. I had run it during the day to see if it worked at all, and it spotted us in the garden. At around 9pm when it was dark I popped down to see if it was still working. So I think I need to do a few more experiments before I become wildlife photographer of the year! Still, these things all take time, but it is a cool bit of kit to try out. What we really need it a weather proof Kinect 2.0 ? Back in the mid 80’s a game arrived, initially only on the BBC micro computers, that anyone I knew who was a gamer was very much into. That was Elite. It marked a departure from the arcade style side scrolling platform games and gave us the freedom to fly a spaceship in a massive galaxy. Everything was a line drawing, vector graphic style. That did not matter as the feel of the game and the spirit of it captured our collective imagination. It was 10 years on from having seen the epic space dogfighting in Star Wars. Now we had the chance to engage in space battles and roam the galaxy from our own bedrooms. A key element was trading, that got you cash to kit up your ship. You had to play the supply and demand correctly. Buying goods cheap and selling them for a better price to make a profit (after taking expenses like fuel into consideration). Before you could trade though you had to dock with the various space stations across the galaxy. These spinning objects with the look of a D&D dice were key. They rotated slowly around the axis that led to their entry port. You had to match you speed and rotation to try and get through the airlock. Many a ship was lost smashing into the station, over compensating or rotating the wrong way. If you made it though and made enough money you could buy a docking computer. This did the job and on my C64 version is played the Blue Danube as we were slowly lined up to dock. Key to all this though was the fighting, the cat and mouse of 3d space battles. Leading the target as you pull a tight turn and let loos with the lasers. The more of this that you did the higher your ranking from mostly harmless up to Elite. The iconic scanner telling you the height and position of the other ships relative to you has been much copied since. We are now in a era where the best copy of all is being made. Elite Dangerous is the full 21st century remake of the game. It was also funded in the new 21st century way of crowd funding. The Kickstarter campaign raised an awful lot of money and enabled David Braben and his company to get building this new epic free roamer. As a backer as a sufficient level you get access to play the alphas and the betas of the game. This early access is of course helping the company out aswell as making the backers feel special and part of something. A brand and fan base for a game like Elite is made up of people my age. It is obviously a game that we all played 30 years ago. I have of course been playing it, and also giving it a go on Oculus Rift, though I am waiting on my DK2 to play it properly with the headset. It is most certainly Elite. It feels like it did back then. Though it looks very different. Of course we no longer have simple vector graphics, we have fully rendered ships and stations with intricate detail. Planets and a stars, moons, and space phenomena that add to the atmosphere. Docking has a whole extra experience. You still have to navigate through the rotating airlocks, but you actually end up in the station and have to find your allocated docking back and perform a gently landing manoeuvre to engage with the star port services. I had been playing using a 360 style joypad as I generally use those on console games so figured it would be better than the keyboard. It turned out that things got a little tricky. So I bought F.L.Y5 fancy stick and throttle. When I did that the game got way better, felt even more immersive. I had not used a stick like that for many years. I used to play Combat Flight Sim 2 over dialup modems in the late 90’s with a force feedback sidewinder. I should have remembered how awesome that felt sooner! I am playing on a mid to high range windows laptop (the Mac version will not be for a while yet) but it’s flying pretty well. With the stick I managed to get docked more accurately and quickly, even won a few more of the training scenarios (which had proved tricky). What has been great though is just entering the online universe. There are obviously other people there, but you can also just go about your business and travel around the systems that are open for the beta doing you thing. I did get involved in an NPC space dogfight, it was going on for a 15 mins or so. I felt I was just about to win when I was joined by what I think was another human player. They spotted my cargo and my lack of health after the long battle and set upon me. I had to try and flee. The tension as the hyperdrive powers up and the 5 second countdown, whilst under intense fire trying to shake the attacker was really exciting. I made it out of the system and got repaired. The free form exploring and trading had made the galaxy already feel like a place. I tweeted I felt like I had been somewhere. This is a key element of a virtual world, of a metaverse. Of course Elite has competition, Star Citizen a massively funder space drama from the creator of Wing Commander (which was inspired by Elite), and the immensely impressive looking No Man’s Sky. The latter is, like Elite, procedurally generated, though it has the richness of visit the planets, seeing other life forms evolving. It’s a different game but is going to be a free roaming space epic too. I think there is room for all of them. This is a genre seeing a real next generation push. Back to the beta, being a beta it will crash and have the odd problem but it has been very stable for me. The only problem I had was when there was a ship parked in my docking bay. I double checked the numbers and it was my bay and it was not shifting. I couldn’t tell if it was a bug or a simulation of a lack of admin efficient at the base. I can tell you that in my frustration suggesting a ship move with a small burst of laser fire at the badly parked ship does indeed lead to a rapid response from the authorities, thats another ship lost then! I flew a few trade missions and made a little bit of cash and noticed I could buys docking computer. I was not overly surprised, but very happy when I engaged that whilst heading to a star port and in kicked the Blue Danube again. Not an 8-bit rendition of course, but a fully realised orchestral recoding. 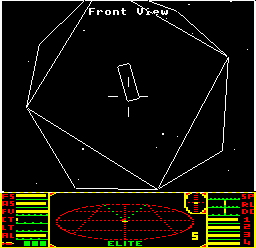 Elite Dangerous is Elite, fully coloured in and with other people in there with you. It is looking very promising and I am enjoying learning the ropes again. I should also add that the predlets were fascinated too. Just as when I started playing minecraft they were looking over my shoulder. Predlet 2.0 took to the stars and go into his first dogfight. It is not obvious how to bank, turn and yaw in space, it may be easier to learn planes first. However he did get a few good shots in before getting got. They have also seen it sat in the cockpit wearing the original Oculus Rift and were amazed at that too. So this is not just us old gamers yearning for the past. This is exciting stuff for all of us. We are in interesting times for developers. A beta is no longer just a working prototype. Instead it has to be a workable, playable, usable experience. The aim of a beta now is to stress test network code, to examine mass user player statistics and to get the people who want to play your game to help build it. Bungie made a big splash the last few weeks with their Destiny beta. Initially you had to buy into the beta by preordering. That gave you access to test. So… based on the reputation of the developer (of Halo) you could get an access code to download and join in a mass test if you promised, or actually bought it. I was interested, but I was not so interested in having to pre-order a physical copy in order to access it. Xbox One does not have digital pre-orders yet. I was happy to see the beta just turn up anyway though. In this case it was for Xbox Live Subscribers. So obviously they needed more people. It was, I have to say, very good. It had a slick next gen feel to it, but it was also very “metaversey”. The initial mission of this RPG FPS had you run around and shoot a few things, but before long you were in the lobby/hub/base. I gounf it very amusing as the little unity3d project we have been doing has a room and a table and window out into space, and I was also surprised a relatively serious RPG had dancing mapped to the dpad. There were a few comms gestures. It was possible to shout Xbox Record That and then edit it up in Upload studio and sent it to onedrive, of which this link should work. It was great ti drop into 3 player team coop and spending 20 minutes reviving one another as we tried to take out a monster spider machine. It was just a shame it crashed just as we did. That of course is the price of beta testing, you can’t moan, you can only think that your presence and activity has helped make it just a little bit better.